I recently reviewed The Tale of Halcyon Crane (which I really liked), a book I discovered via a free email book club. I joined the club several years ago and each day I receive an email with a short excerpt of the book being featured that week. It’s a great way to sample books and discover new authors—all while drinking your morning coffee. To sign up, go to DearReader.com and select which book clubs you would like to join. You can select from Fiction, Non-Fiction, Mystery, Romance, Pre-Publication, Teen, Audio Books, Thriller, Sci-Fi, Good News, and Business. For each club you join, you will get a separate email Monday through Friday with a few pages from that week’s selected book. 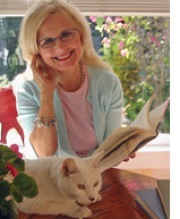 Suzanne Beecher is the woman behind DearReader.com and she writes a daily column that is included with each email. She writes about everything from reading to baking to her grandchildren. Plus she runs a regular contest where she bakes homemade chocolate chip cookies for one lucky winner. Since I enjoy the book club, I thought I would pass along the info for anyone who is interested. There are often weeks where I’m just not that into any of the featured books, so I just delete the emails and wait for new books on Monday. But occasionally, like with The Tale of Halcyon Crane, there is a book where I can’t wait to get the next excerpt. Is anyone else a member of the Dear Reader online book club? Have you discovered a great book this way? PS: Daemon’s Books is in no way affiliated with Dear Reader Online Book Club.